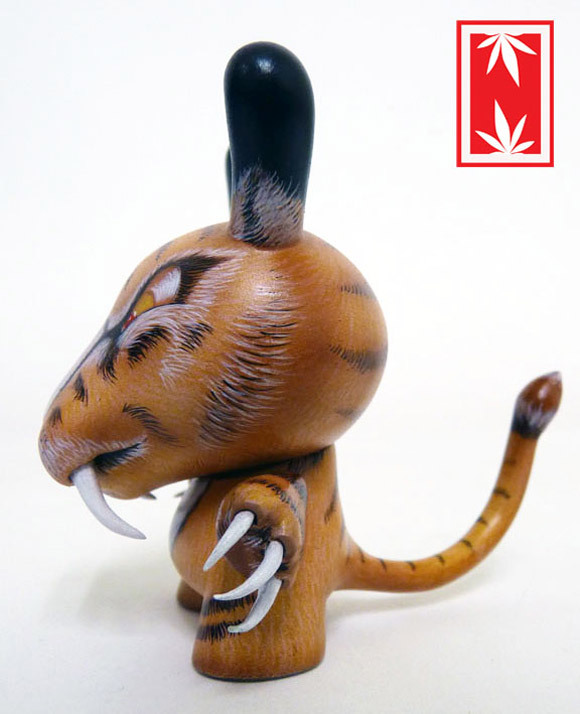 Custom artist extraordinaire, Ian Ziobrowski ‘s newest commissioned work is an incredibly detailed Sabertooth Dunny. Standing merely 3-inches tall, Sabertooth has a ferocious growl and fears nothing in the wilderness. He is also one of the many characters in Ian’s ever expanding NUGGLIFE collection. During Nuggs’ hustle, he encounters many species. Either wanting his crop or wanting his flesh. In this fight for survival you never know what’s gonna pop up. Lets just be happy Nuggs got away from this one. Get acquainted with NUGGLIFE and more of Ian’s finely tuned characters on his Flickr page.